Imagine this scenario: you are in an elevator at a large hotel. The doors open and a stranger steps in, looks at you, squeals in delight, throws her arms around you, and says “I want to be your new best friend!” How would you react to that? Personally, I would be horrified. And I would get off that elevator just as quickly as possible! As humans, we realize that this is abnormal behavior. Yet we allow our dogs to do a canine version of this to people and to other dogs. It’s not appropriate and it’s not safe, yet it is very common. I wish I could remember to original source of the term “elevator behavior” so I could give that person credit. It was at least 20 years ago when I first heard it. The term was used in the context of describing the behavior of conformation dogs who are able to wait quietly in a group with others very close to them without reaction. Just the same as we humans can stand in elevators uncomfortably close to others and ignore each other except for a very quick nod or short hello. I don’t know about you, but I don’t feel like an elevator is the appropriate place to make new friends or share my life story. If you do behave that way I honestly hope I’m never in an elevator with you! Humans have clear social norms about how to act in what might be uncomfortable situations. There are times when it’s best to make minimal eye contact and ignore those around you. If I ran up to unsuspecting people I didn’t know well and threw myself at them, making full body contact, that’s not considered friendly. That’s inappropriate. And it might even be considered physical assault. We’ve been taught, rightly so, to keep our hands and bodies to ourselves and to not invade the personal space of others. We should teach our dogs this same basic concept. In case you haven’t noticed, I’m a bit obsessed with dogs. I think they are all awesome. However, in public and on first meeting, I will ignore them. This is not because I don’t think your dog is amazing and want to interact with him. It’s because I have enough dog savvy and self-control to simply exist in the same space with your dog unless and until interaction is appropriate. I’ll be heading to Clicker Expo this week and lots of dogs will be there. I will keep my baby talk voice and grabby hands to myself! If I happen to be talking to you and your dog engages with me in an appropriate way then I may ask if I can greet and pet. That’s what adults do. I do it because I have respect for your dog and your training goals. You know what isn’t helpful? Squealing at the sight of a dog across the room, racing over, working that dog up into a frantic overly excited emotional mess, and then, when you are satisfied with the interaction, heading on your merry way. How about you don’t ever do that again? That is not helping socialize a dog or puppy to humans; that is teaching a dog or puppy that humans are put on earth to work them up into a state of frenzy and over arousal. It would be really easy for everyone to help everyone else train appropriate elevator behavior to dogs we encounter in public. Ignore them unless it is truly appropriate to do otherwise. Smile at the owner and honestly say “lovely dog”. Keep your hands to yourself! If a dog approaches you in an inappropriate way be neutral and allow the owner to help the dog settle down and regain his composure. You will be doing that dog and owner a huge favor by helping with this process through your lack of reaction. This isn’t mean, it’s polite and helpful. Dogs are not public property for our amusement and enjoyment any more than other humans were put on this earth to make us happy at their own expense. We are not doing them any favors by teaching them that it’s okay to approach and interact with all humans. It’s not. Some people are allergic, some are afraid, some are physically frail. It’s also not okay for them to approach and interact with all other dogs. Just because they are the same species doesn’t mean they should be instant best friends on sight. Those others dogs may be afraid, or frail, or simply not be looking for more friends. Other people and dogs have every right to exist in the world without your dog invading their personal space. That doesn’t make us, or our dogs, unfriendly. It means that we accept and respect social norms and personal boundaries. Let’s all show respect for each other and teach all our dogs appropriate elevator behavior. It’s your responsibility as an owner and it will be so much better for your dog. Elevator behavior is good! Let’s make it a new normal for our dogs. *Thanks to Denise Fenzi, Amy Cook, and all the FDSA instructors for discussing these issues and making me think more deeply about them. dobebug, Cressrb, CRDobe and 1 others like this. My pet peeve...I'm at the vet or in the park and another dog owner will let their dog come close to Mocha and me, sometimes without really watching or paying attention. Just because your dog loves everything and everyone, please don't assume mine does too. And, since I don't know your dog, I have no idea of its temperament. And don't get me started on parents who let their kids run over to every dog they see. One of my major "pet peeves" also. McCoy has been trained to be non reactive to other dogs. Still he gets yapped and nipped at by some passers by. Sometimes more aggressively. I have always assumed that it is because he is an intact male, somewhat stoic and hard for other dogs to read. So... M and I have a deal. If he feels uncomfortable with an approaching dog (s). He comes over to my side and lies down until the "threat' has past. I've worked so hard with Mocha to get her comfort level where it is today, and I know all it takes is one incident and we could be back at square one. So, I try my best to be very aware of other people and dogs so that I can intervene if necessary...this can be hard at the vet on a crowded day; we usually stay in a corner or even go back outside if it's too bad with little kids running around and a lot of people with their dogs (and some of them on retractable leashes!). All I have to do is look at Mocha's back...if I start seeing the dandruff, it's time to grab some fresh air LOL. 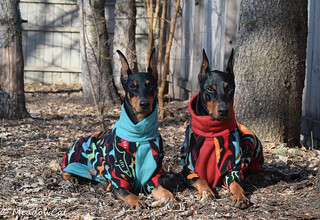 I would say most people around here are respectful of our space, Dobermans aren’t very common so they usually give us a wide birth. We doo have adults and children who will ask to pet our dogs, I evaluate the situation...do my dogs seem relaxed? Are the children calm or rambunctious? And decide accordingly if I will allow the interaction and I have no problem saying no. I also teach my dogs that it is not okay for them to rush up on people and greet them, I expect them to remain calm by my side while I am interacting with someone and only if I give them the say hello command are they to approach. Sully knows this well, Rizzo is still learning. I remember one time I was at Lowe’s with them and I was talking to an employee, she wanted to pet, I said ok and allowed the dogs to approach. There was another lady near, looking at something on the shelf with her back to us. Sully forgot his manners and stretched his head over towards her and sniffed her. She turned around and freaked out and tried to climb up the shelf, she was terrified of dogs and I felt like a complete jerk. I apologized profusely and told her he knew better but got excited and forgot. She was understanding, but still visibly frightened. Our vet has a back door which leads to the exam rooms. If one calls in advance, the will meet you at the back with the exam room prepped and ready. Used it today with my buddy's very sick Rottweiler. He is paralyzed, so we did not want to carry a huge dog into the waiting room. Our vet will do the same thing with reactive cats! Its really nice. Did this thread start out as 'Puplic Behavior'? Or is this a new one or did I just think I saw it spelled with a 'p' instead of a 'b'? I thought it a cute play on words. Just don't leave the "L" out. Yes, when I first saw the title "Puplic Behavior", I thought it was another thread about Dobes using their long snouts to "Dobe Poke" human aquaintances in their sensitive areas, as described in several past threads. Last edited by spocksdad; 03-19-2019 at 08:49 AM. Lots of truth in your article Meadowcat - I have found out that when I take Mr. B to say - Rural King or Tractor Supply - Lots of people walk up with there kids and start talking about Mr. B , then in 2 seconds , they ask if the kids can pet him - I say I really don't want them to - I get a chitty look and they grab there kids and leave - One way I handle that now is - I say No - he is in distraction training - they look at me and then ask - is it ok to talk to you ? which I say sure . They ask all the questions about him and all the time , Mr. B is just sitting there - looking around some - but never moving , When there done - they reply on how good he is doing - I like this approach better than getting the bad look . Also - the only problem I have had with Mr. B - is to getting him to turn off the other dogs , Like Mocha and TN - This is harder than one would think to cure - But in time and lots of work - they get it . On a side note...the darndest thing...our daughter came home to live with us a while, and she brought her little yapper with her. And Mocha never growled or barked at her once. It's like the dog has lived with us for the last 5 years. Go figure LOL. I usually tell people no he/she is working right now but thanks for asking...I like your “distraction training” though, I’m going to have to use this! McCoy loves human interaction. The Sheriff... Not so much. If I am walking them both and someone asks to pet them, I say: "The big guy, sure. The little guy is not fond of strangers". And that was supposed to read " I know she'll NEVER get to the point." Sheesh...and I read over that before I hit save. Last edited by TNfisher; 03-20-2019 at 08:06 PM. So love this post! Going to print and put in the puppy obedience class packets. Such a great way to make the whole piece of info “stick” instead of going in one ear and out the other. Thank you! !